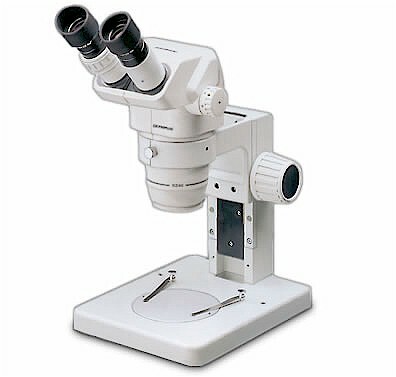 The Olympus SZ series Stereo Zoom Microscopes are of excellent quality and performance. They provide superb resolution, high magnification and compact design. Ideal for a wide variety of applications including medical, pharmaceutical, biological research, material sciences, mineralogy, metallurgy, semi-conductor and quality control. Extra long working distance optics make this series ideal for integration into bonders and probers. A wide range of accessories are available. The ultimate research stereo zoom model for high magnification. This model offers a zoom ratio of 6.1:1, 1.8x to 11x zoom range and up to 330x maximum magnification with a working distance of 73mm. SZ6045 A very versatile model with a zoom ratio of 6.3:1, up to 189x maximum magnification and 100mm working distance. Several stands and bases are available. We can also mount these on most any stand that you choose. SZ4045 The work horse of the Olympus line. Fine optics, 6:1 ratio, .67x to 4x zoom range, up to 120x maximum magnification and 110mm working distance. This is an affordable modular design microscope for use with bonder and prober stations. A zoom ratio of 4.4:1, .9x to 4x zoom ratio, 120x maximum magnification and 110mm working distance. Eyepieces - 10x (FN22), 15x (FN16.5), 20x (FN12.5), 30x (FN7), Filar Micrometer Eyepiece. All eyepieces are wide field high eyepoint. Cold Light Source - Highlight 3000 (20v / 150w), a complete line of goosenecks, flexible wands, ringlights and accessories are available. Observation Tubes - Binocular tube, trinocular tube, tv/photo adapter, binocular w/ coaxial illuminator (6v/20w Halogen) NOTE: SZ30 is equipped only with the binocular tube. *With specimen tilted at an angle of 20° or less.